This volume is the outcome of the international seminar on Bhartrhari: Thought, Language and Reality held in New Delhi on 12-14 December 2003 as part of the centenary celebrations of Mitilal Banarsidass. In this seminar, scholars from all over the world presented their interpretations of Bhartrhari's Philosophy, some in the light of the modern trends in philosophy and linguistics, others in the backdrop of Indian tradition. This volume contains almost all the papers presented at the seminar along with some other papers invited from scholars who could not participate in the seminar to make it comprehensive. The papers discuss the metaphysics of Bhartrhari and his ideas about questions concerning language and reality. 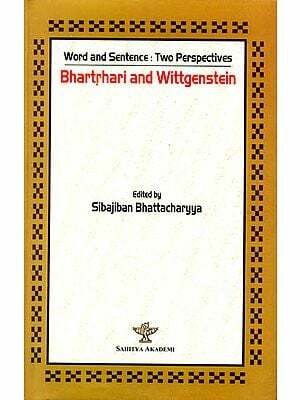 Some of the papers compare Bhartrhari with Western Philosophers and linguists like Wittgenstein, Grice, Searle, Humboldt, Chomsky and Goldberg, thus showing his contemporary philosophy and linguistics. It is clear that after the initial efforts in the fourth of sixth decades of the twentieth century, Bhartrhari studies have now gained a significant momentum. Mithilesh Chaturvedi teachers in the Department of Sanskrit, University of Delhi. His publications include Vrttisamuddesa of Bhartrharis Vakyapadiya: A study and several research papers and articles in journals and magazines. He has translated an anthology of Sanskrit poetry entitled Kavyasangraha, Part-I from Sanskrit into Hindi. He has also translated three works from Engilsh into Hindi including Gaurinath Shastri's The Philosophy of word and meaning. Currently he is engaged in an annotated Hindi translation of Helaraja's commentary on the third Kanda of the Vakyapadiya. The year 2003 A.D. marked a century of Indological publishing at Motilal Banarsidass. What had begun as a humble business enterprise in Lahore in the year 1903, has over the decades, blossomed into a house of international repute in the field of Indology. During these momentous years, we have undergone several vicissitudes and passed through many a testing time. Our commitment to the mission of Indology has, however, remained unshaken. If anything, it has only gathered strength and momentum. The centenary year, celebrated at MLBD during 1903-04, was our humble tribute to the founding fathers of this House. Several programmes and functions were organized in different parts of the country. These programmes concluded with a three-day international seminar on Bhartrhari: Language, thought and Reality at the India International center, New Delhi, on December 12-14, 2003, in which some of the most eminent scholars and specialist deliberated on the subject, taking into account, inter alia, the contemporary relevance of the rich legacy of this grammarian-philosopher. As we sat to finalise the theme of the seminar, taking into account its propriety and relevance to the occasion, the question that exercised our minds was, "What does a publisher, in particular a publisher of Indological literature, do?" On this we debated through long hours extended over several weeks. We consider it consider it necessary to share, in brief, the process we underwent in taking the final decision. The scholar, the specialist or the researcher delves deep into the universe of word and thought. He surveys the vast empire of the masters of the past, gleans the choicest pearls from its treasure-trove and, in the glow of his intellectual experience, weaves a garland of letters and words and, in the process, makes value additions of major significance, so that the connoisseurs of words, thought and meaning enjoy and enrich themselves. There, then, are the creative writers too who, with the warp and weft of words, weave the magic of emotions and thoughts to reach out to the generations, present and future, that stay under its spell. As years move on scholars, specialists and experts of a different time delve into that creative universe of emotions and thoughts to experience the nature of reality as enshrined in their work. And a publisher becomes the vehicle, the transport, the medium, on which this great empire of learning, wisdom and creativity rides to so across to the present and future generations of the learner, the wise, the creator and many a lay reader who simply seeks his delight in the realm of letters. Millennia of variegated Indian wisdom have inspired authors to increasingly enrich our inheritance and placed a pleasant responsibility on the Indological publisher is the common link between the author and the scholar of the reader. And for both, author and publisher, while exploration of the nature of Reality may be the raison d-etre for this effort, it is the word that is their wherewithal in this pilgrimage. Hence, Bhartrhari, with his grand preoccupation with the philosophy of grammar, semantics and thought, was identified as the theme of our seminar. We are grateful to all the eminent experts and intellectuals of international eminence who participated in the seminar, at our invitation and made valuable contribution to its proceedings. It has taken us rather long to collect, collate, compile, edit and publish the entire material and, finally, bring it to our readers. The task was, in fact, complex and demanded perseverance and unrelenting hard work on the part of the editor who made large investment of his time and labour in order to make it possible for us to bring this volume out. We hope this volume shall prove useful to all the serious students of the subject and motivate them to carry further the research in this sphere. Motilal Banarsidass is a name to conjure with in the world of Indological publications. Their renown as publishers of original works in Sanskrit and Prakrit and standard research works in all the branches of Indological learning hardly needs to be emphasized. Their centenary celebration was an International Seminar on Bhartrhari. The Seminar was resounding success. Scholars from different parts of the world attended it and contributed to the furtherance of research in the writings and doctrines of Bhartrhari. Many have contributed to the study of doctrines and texts in Bhartrhari. Many have contributed to the study of doctrines and texts in Bhartrhari using the standard methodology of classical philology and historical research. This methodology depending on text criticism, collation and documentation in now an accepted part of Indological research. Some papers however attempt studies from a philosophical or linguistic science point of view. Vivartate rthabhavena prakriya jagato yatah. Outlines the doctrine in a nutshell. Brahma is the original principle of the world. It is without beginning and end. It is essentially one and eternal but is capable of differentiation through its association with its powers. This process of appearing as different without losing its essential identity is termed vivarta. Even till the age of Sankara the word vivarta had virtually the same sense as parinama. Pre-Sankara Vedanta from Badarayana onwards clipped upon the world as a heterogeneous transformation of Brahma. Brahma is one, eternal and sentient. The world is manifold, transient and insentient. And yet the world is the parinama or vivarta of Brahma. This manifestly illogical doctrine leads Gaudapada and Sankara to argue that the world is an illusory appearance. The Sankhya doctrine of parinama kept sentience outside the process of temporal transformation. In Bhartrhari however vivarta seems to be the same as a realistic parinama. But there are many overtones of illusionism. Thus Brahma is differentiated by its saktis, which include that of avidya. Change and reality are appearances. Objects are meaning constructs comparable to dream phenomena etc. Even though Bharthrari's vivarta is close to parinama, in the sense that it is not an illusory transformation, vevertheless it is not real change either. The differentiation of forms or the process of activity in time is regarded by him as appearances only. These changing appearanes serve empirical purposes. The inward nature of Brahma is hidden in consciousness. But it has the power of expressing itself as communication. This capacity of self-expression and communication gives it the character of word. The essence of the eternal reality of Brahma expresses itself in the diversity of the empirical world as the word and meaning. There is no doubt that creative power is definitely attributed to speech. This theory of sabdadvaita and also that of creation by word and thought can only be understood as self-expression. It would, thus seem that Bhartrhari is committed to a realistic theory of the world. However, if we reflect over the nature of he meanings intended by words or the objects projected by thought, it is difficult to see how these could be called real. The object of speech and thought can hardly be said to have any reality apart from their appearing to consciousness. The linguistic model of creation shows the purely phenomenal nature of the world far more clearly than the older Vedantic analogy of the clay and the pots made out of it. Aprthaktve pi saktibhyah prthktveneva vartate. In particular it is the power of time with its assumption of divisions and parts, which imposed the process of change in Brahma as the ground reality. Janmadayo vikarah sad bhavabhedasya yonayah. As a result of differentiation the unity of Brahma appears to be split into the world of subject, objects and experiences. For Bhartrhari the scope of perception and inference is limited to empirical objects. The knowledge of supra-sensuous reality can come only from the agama. Even the intuitive knowledge of the seers depends on the agama. The gateway to the understanding of the agama is the science of grammar. Yat tat punyatamam jyotis tasya margo yamanjasah. Sabda as the matrix of the world is to be distinguished from speech and language as found in common experience. These belong to dhvani or sound and immanent regulatory order. One may say that just as the graphic form of the word stands for the phonetic form, the phonetic form stands for the ideal word as a significator, which is inseparable from thought. Behind the spoken and conventional language there is a deeper language of thought. This in turn is the discursive form of intuitive or pasyanti, mental psychological or madhyama and phonetic or vaikhari. At the level of sound as dhvani language of speech becomes divided into numerous languages or speeches. Each language uses a different set of phonemes in a different order to signify the same or similar objects. But this dissimilarity of words and their constructions at the level of dhvani disappears largely at the psychological level so that different languages become translatable and their meanings intelligible even without their specific linguistic form. This suggests the notion of sphota as an ideal word which has no necessary connections with the particular sound patterns. For the grammarians pada-sphota was an abstraction from vakya-sphota. Ideally there is one or comprehensive affirmation, an infinite judgment unified in a single self-expressive act of the omniscient consciousness. This is pranava, the matrix of the Veda from which begins the tradition of knowledge (agama) increasingly diversified into the sciences. Bhartrhari's ideas on language were foud highly suggestive by Buddhist logicians who however used them for purposes of their own. For the Buddhist, the word is the inbuilt force of illusion in thought not the revelation of reality. But they agreed that sabda and vikalpa are inseparable. Vikalpa is not a pure signifier like some ideal word. It is a determination or differentiation, marker in the stream of experience. Consequently meanings are not self-subsistent or independent objects. They are mental constructs. Some of these reflect innate tendencies of the mind, anadivasana. It deserves to be noted that these categories have been regarded as purely logical or transcendental in Western thought which abhors the psychologising tendency. In Bhartrhari however, what is revealed at the level of thought is not the original product of the psyche but a reflection with inevitable distortion of a metapsychic vision. The Kashmir saivas accepted the doctrines of the multiple levels of language. Somananda had been very critical of the doctrine of Bhartrhari, largely because he understood Bhartrhari's sabda-brahma as a insentient principle. This however is a misunderstanding. Later philosophers of the Pratyabhijna School held a different view. Since pasyanti appears to refer to the knowledge of Sadasiva, they posited a fourth state called para. Sankaracarya rejected the concept of sphota altogether and placed sabda including the Vedas in the phenomenal world. As the papers of the Seminar show, there has been considerable interest in the study of Bhartrhari as the philosopher of language. Some papers study specific doctrines and texts from Bhartrhari following, as mentioned earlier, the methods of classical philology or historical research. This methodology is well entrenched in Indological or historical research. A few papers attempt the comparative evaluation of ideas such as pratyavamarsa, dhvani or kala. Some point to the need for opening the doors of independent philosophical research or of approaching Bhartrhari from the insights of new direction in linguistic research. The Seminar succeeds in highlighting the importance of Bhartrhari as a philosopher of language as well as metaphysician and the immense areas of research which lie ahead. While there are several partial translations of Vakyapadiya, a complete, lucid modern translation of the Vakyapadiya itself remains an outstanding desideratum. Motilal Banarsidass need to be thanked for the lead they have taken in opening up what may be called a whole new branch of research in philosophy and indology. This volume is an outcome of the international seminar on Bhartrhari: Thought, Language and Reality held in New Delhi on 12-14 December 2003 as part of the centenary celebrations of Motilal Banarsidass. In this seminar, scholars from all over the world presented their interpretations of Bhartrhari's philosophy, some in the light of the modern trends in philosophy and linguistics, others on the backdrop of Indian tradition. This volume contains almost all the papers presented at the seminar along with some other papers invited from scholars who could not participate in the seminar to make the volume comprehensive. The papers discuss the metaphysics of Bhartrhari and his ideas about questions concerning language and reality. Some of the papers compare Bhartrhari with Western philosophers and linguists like Wittgenstein, Grice, Searle, Humboldt, Chomsky and Goldberg, thus showing his relevance to problems in contemporary philosophy and linguistics. It is clear that after the initial efforts in the fourth to sixth decades of the twentieth century, Bhartrhari studies have now gained a significant momentum. The keynote address delivered by V.N.Jha at the beginning of the seminar raises a number question about language which have drawn the attention of philosophers since the Rgvedic period. Some of them are: How do we speak? How does the listener understand an utterance? What is the nature of language? How does it capture human thought? Jha also touches upon a number of other issues such as the purpose of grammar, the subject-matter of the Vakyapadiya and the philosophical presuppositions of Bhartrhari. He also cautions against taking Bhartrhari's text outside the context and losing track of the tradition in which Bhratrhari's text outside the context and losing track of the tradition in which Bhratrhari's work came into being. In his paper "Veda revelation according to Bhartrhari", Ashok Aklujkar discusses the connotations of words like saksatkrta-dharman and pratyaksadharman used in Bhartrhari's Vrtti and earlier by Yaska and Patanjali. He interprets dharma as ‘properties of things'. According to him, Bhartrhari uses the word veda in more than one sense: Veda in a subtle form as appearing in the vision of seers comes before the sequential language form of the textual corpus that is later divided into four Vedas and different sakhas. Aklujkar equates Veda in pre-revelation stage with para-pasyanti-rupa or the language principle itself and the first revelation with pasyanti, i.e., the active or the extrovert stage of it. He also thinks that Bhartrhari's account of Veda revelation is not an expression of faith only but also has philosophical content and there is empiricist spirit in the account. He further draws the conclusion that although Bhartrhari has genuine reverence for the Veda, he opts for theoretical fictions when necessary. Aklujkar has added four appendices, mainly discussing the relevant Vrtti and Nirukta passages textually, to his paper. Johannes Bronkhorst examines the question of Bhartrhari's Vedic tradition. On the basis of an examination of Bhartrhari's Vedic quotations and ritual details, Bronkhorst concludes in his earlier papers that Bhartrhari belongs to the Manava Maitrayaniya school of Veda. In the present paper, he tries to explore the extent to which this school may have influenced Bhartrhari's thought. He compares Bhartrhari ideas with those found in the available Maitryani Upanisad and in Manusmrti. His conclusion is that the original Maitrayani Upanisad might have influenced Bhartrhari's thought. He also maintains that Bhartrhari Knew and probably used a Manava Dharmasastra, which was a predecessor of the present Manusmrti. George Cardona presents Bhartrhari as a faithful follower of the tradition. In Cardona's opinion, although Bhartrhari on many occasions innovates, he does not lose track of the tradition. Cardona discusses in detail Bhartrhari's view regarding the sentence and sentence meaning as impartite wholes and shows that this thesis is not without traditional support. Bhartrhari says that he bases his conclusions on linguistic behavior and may sometimes ignore ontological considerations (cf. sabdapramanaka vayam). In this context, scholars have talked about his spirit of accommodation and his perspectivistic approach. Cardona discusses the background behind Patanjali's and Bhartrhari's treatment of different semantic issues and the reasons why they felt an obligation to include different views in their works. He shows that in spite of presenting several views, both Patanjali and Bhartrhari have a distinct preference for a particular viewpoint. Wherever essential tenets of grammarians are concerned Bhartrhari seriously defends his own position. Madhav M. Despande revisits the notion of sista in Bhartrhari, which he has discussed in some of his earlier publications. While the sistas of Patanjali are an idealized contemporary community, for Bhartrhari sista is both a rsi and an acarya. Panini makes a distinction between rsi and acarya (grammatical authority and teacher) but Bhartrhari calls grammarians like Panini and Patanjali rsis as well as sistas. He lays emphasis on agama on Bhartrhari is engaged in re-establishing the Vyakarana tradition which according to his own description had become obsolete. He claims agamic foundations for his grammatical tradition in order to distinguish it from non-Vedic traditions. In Deshpande's view, the reification of grammarian sages was only a small part of this project. K.D. Tripathi looks at the Vakyapadiya as a work of vyakarna-agama and its first five verse as the core of that agama. Tripathi discusses Bhartrhari's idea of thought being impregnated by the word and states that it does not mean that Bhartrhri admits savikalpaka cognition only. Tripathi views Bhartrhari's notion of vivarta as undamentally different from that of Sankara. In Bhartrhari's philosophy it is the free will of Brahman which is responsible for its appearing as experiencer, experienced and the experience itself. The notion of power as freedom is implicit in the Grammarian's doctrine while it is explicit in Kashmir Saivism. Tandra Patnaik discusses the relation between language and thought and tries to explore whether thought is independent of language or language-determined in Bhartrhari's philosophy. She presents a study of Bhartrhari's philosophy vis a vis the western language philosophers. How does a listener imderstand a unitary meaning from a stretch of sounds? And how does language function in limitless ways? Patnik feels that most Western philosophers have failed to pay attention to such problems because they take much for granted. Bhartrhari's answer here would be that the power to use language in limitless ways is rooted in the linguistic competence (sabdabhavana) inherent in each human being. Sphota is connected with this linguistic competence. Following B.K Matilal, Patnaik understands Bhartrhari's sphota as language principle. She prefers to propositional content and the speech act. Mithilesh Chaturvedi in his paper discusses the relation between language and reality according to Bhartrhari. To explain this relation Bhartrhari admits a two-fold existence in the field of linguistic usage: mukhya satta and bauddha or upacara-satta. Our linguistic usage takes place on the basis of an existence created by mental constructs. The paper shows how, by admitting this two-fold existence, Bhartrhari solves various problems concerning language such as the problem of negative statements and that of usage expressing absolutely unreal objects like hare's horn, barren woman's son, etc. This also explains the two way cause-effect relation between word and meaning and leads to the grammarians' thesis that word and meaning have a mental status. Pierre-Sylvain Filliozat discusses the concept of time in Bhartrhari's thought. According to Filliozat, Bhartrhari conceives time as independence of the supreme principle and thus reconciles the unity of Brahman with the multiplicity of phenomena. Kalasakti is the first power which holds its sway over other powers, and which is the main location of transformational process. Filliozat shows how Bhartrhari's concept of time has considerably influenced Saiva Siddhanata philosophy. He also points at the close resemblance between Bhartrhari's Vakyapadiya and Bhatta Ramakantha's Matangaparamesvargama. Hidevo Ogawa analyses Bhartrhari's notion of ‘power' (sakti) which plays a critical role not only from the point of view of his metaphysics but also from the point of view of his linguistic theory. Bhartrhari's postulation of power enables him to defend his advaitic position. At the semantic level, a power is viewed as distinct from substance while at the metaphysical level it is non-distinct from its locus. Vladimir P.Ivanow studies Bhartrhari's advaita taking into consideration the concept of vidya and avidya. Although Bhartrhari considers sastra as belonging to the sphere of avidya, he says that the vyakarana-sastra is a means to liberation. Ivanov solves this apparent contradiction by saying that progression from avidya is a natural process in Bhartrhari's philosophy that presupposes the necessity of both. According to Ivanov, Bhartrhari's position seems to be close not to Advaita Vedanta but to Kashmir Saivism. 1. Language and Reality are one; 2. Language and Thought are one; and 3. Sentence is the primary unit of language. Mukhopadhyay refers to modern philosophers' versions of these theses, which are not as radical as Bhartrhari's and are easier to understand, as they do not mix up metaphysical doctrine with philosophy of language. Examining from a realist's position, Mukhopadhyay does not find arguments supporting these theses as sound and convincing. He raises some important questions and also reiterates some old criticism against Bhartrhari, although the answers to some of his objections may be found in the present volume itself. R.C.Pradhan in his paper discusses Bhartrhari's philosophy of language. Bhartrhari's sabda stands for language in the universal sense which is eternal and timeless while speech or linguistic utterance is a descent from the ideal essence of language. It is the descent form the timeless to the temporal order. According to Pradhan, sphota is the underlying reality of all languages and thus spohota and sabda are identical. Pardhan also discusses Bhartrhari's theory of meaning and his idealist position. Karunasindhu Das surveys a wide range of literature regarding different approaches to language and shows how Bhartrhari's Vakyapadiya accommodates the linguistic traditions prevalent in its era and helps their further development in the days to follow. He discusses questions like the relation of dhvani to sphota and that between word and meaning and sabda and apasbda in different traditions and concludes that the Vakyapadiya is the source of all these traditions. Bhartrhari has exercised a sizable influence over the thought-structure of Kashmir Saivism. Abhinavagupta, the great exponent of Kashmir Saivism holds Bhartrhari in high esteem. The next three papers throw light on Bhartrhari's impact on Kashmir Saiva tradition and how this tradition interprets Bhartrhari. Navajivan Rastogi looks at Bhartrhari's philosophy from Abhinava's perspective. Abhinava adopts Bhartrhari's terminology, reasoning and illustrations. Rastogi discusses in detail Bhartrhari's statement that there is no cognition in which the word does not figure. He discusses Abhinava's interpretation of Bhartrhari's thesis, elaborating in the process its treatment by the Buddhist and Nyaya logicians and the Saiva Siddhantin. He focuses on Bhartrhari's use of the word pratyavamarsa which he tries to interpret with the help of Abhinava's works. Raeflle, Torella points out in his paper how the attitude of the Pratyabhijna School towards Bhartrhari has changed in the span of only one generation. While somananda severely criticizes Bhartrhari, his direct disciple Utpaladeva intergrates Bhartrhari's teaching into his own system. Torella explores the reasons behind this change of attitude. He argues that Utpala find a mani ally in Bhartrhari and makes use of his doctrine of language-imbued nature of knowledge against the Buddhists, who were his ‘most intimate enemies'. Starting with a discussion on the notion of dhvani in Bhartrhari's works- the Vakyapadiya karikas and the Mahabhasyadipika (=Mahabhasyatika) – Anna Radicchi studies the occurrences of this term in Abhivava's works. She takes into consideration Abhinava's use of the word dhvani in his philosophical works, as well as his musical theory and practice, and proposes that in Abhinavagupta, dhvani no longer means articulated sound but has a variety of meanings. In his paper "Bhartrhari and the Jainas," Jan E.M. Houben shows that Bhartrhari refers to the views of the Jainas along with those of the Mimamsakas, Vaisesikas, Sankhyas and Buddhists. He also points out that Bhartrhari was familiar with the Jaina views on Prakrit and on how the word is articulated. Jaina authors like Mallavadin and Simhasuri also pay considerable attention to Bhartrhari and a study of their works can be of help for a better understanding and appreciation of Bhartrhari. Houben also shows that Bhartrhari explicitly refers to the Jainas in the Mahabhasyadipika but the Vrtti on the Vakyapadiya avoids such references, which "reinforces our impression that the Vrtti is not by the same author." Toshiya Unebe studies Vakyapadiya, 2.119 in the light of criticisms by Kumarila, Santaraksita and Kamalasila. Since the vrtti on this karika is not available, the criticism is particularly helpful for a comprehensive understanding of the view expressed in this Karika. Next, some of the papers study Bhartrhari in the context of questions related to grammar, syntax and semantics, Brendan S. Guillon examines the structure and the placement of gerunds in a sankrit sentence. He analyzes the basic ideas with regard to constituency and word order in classical sankrit prose and presents morpho-syntactic details to properly situate the problem about the use of the Noun phrase to express the agent in a gerund phrase. Although the agent cannot stand on its own in a gerund phrase, its express use in the gerund phrase is not prohibited by the Astadhyayi. It is in this context that the author expounds ‘Bhartrhari's rule' and says that it is the ‘Bhartrhari's rule' that precludes the use of the subject in a gerund phrase since it can be construed as expressed on the basis of the agent of the verb of the principal clause. He also shows how some unacceptable sentences having a gerund which has an agent different from that of the verb of the principal clause. He also shows how some unacceptable sentences having a gerund which has an agent different from that of the verb phrase of the subordinating clause can be ruled out on the basis of Bhartrhari's rule although there is nothing in the Astadhyayi to exclude such sentences. Conclusively, subscribing to the view of desphande (1980), Gillon avers that Bhartrhari's view of gerund is indeed the treatment originally found in the Astadhyayi. Arindam Chakrabarti discusses the concept of ‘object' as treated by Bhartrhari who has discussed various uses of the accusative case in his Vakyapadiya. Chakrabarti starts with the question of free agency in the context of the definition of the agent in Panini's grammar. The concept of the agent naturally implies the concept of the object and so Chakrabarti analyzes with the help of new examples different categories of object given by Bhartrhari. He shows that Bhartrhari's analysis of the object is relevant in the context of the problem of intentionality and in the context of contemporary concerns about moral and epistemological issues. Vincenzo Vergiani deals with Bhartrhari's treatment of ‘sesa relationships'. Sanskrit grammarians use the term sesa to refer to non-karaka relations. Vergiani discusses different types of sesa relationships as discussed by Bhartrhari and says that since Karaka is a general notion and every nominal word may be regarded as connected sense. However it is not karaka in a formal way as the action involved is not in the foreground. Vergiani thinks that Bhartrhari's notion of sadhana is broader than that of karaka and embraces at least some sesa relationships. Yoshie Kobayashi shows in her paper how in Bhartrhari's denotation theory' a thing can be spoken about only when it is connected with a delimiting factor different from it. Thus, according to Bhartrhari, a universal should have a further universal to be denoted by a word, and the word expresses its on universal before it expresses the object-universal. In Bhartrhari, the universals are nothing but mental representations having the property of consisting in a common characteristic. What is the basis of masculine of feminine gender when it is applied to words that designate inanimate and asexual things? Fernando Tola and Carmen Dragonetti discuss Bhartrhari's concept of linga (grammatical gender) on the background of this question. Bhartrhari gives seven different definitions of linga in the 13th samuddesa of the third kanda. The joint paper by Tola and Dragonetti discusses and examines these definitions. In the opinion of the authors, Bhartrhari does not adhere exclusively to any one of these definitions or vikalpas and all of them are valid from a certain perspective. Nuriyuki Kudo discusses the use of the term vakyabheda in Bhartrhari's Mahabhasyadipika. While yogavibhaga or ‘splitting of a rule' is a grammatical device among the Paniniyas, vakyabheda or ‘splitting of a sentence' is considered a fault in the Mimamsa tradition. Kudo argues that in Bhartrhari the term vakyabheda is sometimes equivalent to yogavibhaga, and at other times it means ‘ a separate rule' or is used in the sense of ‘a rule having an additional mening'. Thus vakyabheda is a sort of interpretive method. Nevertheless it has a wider denotation than that of yogavibhaga. While studying the Indian texts on philosophy and grammar, one is inevitably attracted to compare and contrast them with modern theoretical currents. Jan. E.M. Houben in his second paper studies Bhartrhari in the context of cognitive linguistics which is a recent development of theories that are in many respects opposite to those of Saussure and Chomsky. Houben feels that structural approaches to language formulated by Saussure and Chomsky which "implicitly or explicitly guide the students of Bhartrhari are glaringly absent" in Bhartrhari's approach to language and Panini's grammar. On the other hand, most of the assumptions of cognitive linguistics accord remarkable well with the ideas of Bhartrhari. Listing seven foundational assumptions of cognitive linguistics presented by A.E. Goldberg, Houben examines which of them are valid in the context of Bhartrhari. Houben feels that further studies in this direction can be highly rewarding both for Bhartrhari studies and cognitive linguistics. Ana Agud compares Bhartrhari with Humboldt, the German scholar who, she says, was the first linguist in Europe to develop a true philosophy o language but has largely remained unknown. She points out some striking similarities between Humboldt and Bhartrhari. For example, Humboldt talks about the spiritual force of word which is rather unusual in European tradition. Humboldt tries to explain rationally the problem of unity and diversity which also occupies Bhartrhari. Towards the end of this volume, we have a fairly exhaustive Bibliography on Bhartrhari compiled by Yves Ramseier, which is an updated version of his earlier bibliography published for the first time in Bhate and Bronkhorst 1993 (Indian edition 1994). At the inaugural ceremony of the seminar, several speakers had expressed the hope that the seminar would make a significant contribution to the study of Bhartrhari's thought. The quality of the papers and the variety of themes covered by them testifies that this hope has been fully realized. The idea of holding this seminar germinated and took a shape in the minds of Mr. N.P. Jain, Prof. V.N. Jha and Dr. Kanshi Ram and was well executed by the team of Motilal Banarsidass with the able assistance of Dr. Rachana Sharma and Mr. A.P.N. Pankaj. We express our gratitude to them and all those who have worked to make the seminar and this volume a success. We are particularly grateful to Prof. G.C. Pande for contributing a very learned foreword to this volume. Mlbd ,2009 ,new Delhi. Hardcover. New. Bookseller has 5 copies at this price. 30 Day Return Guarantee in stock guarantee.Kindly let me know if you can match the price.